If you have any questions about the REVERIE information page below please contact us. 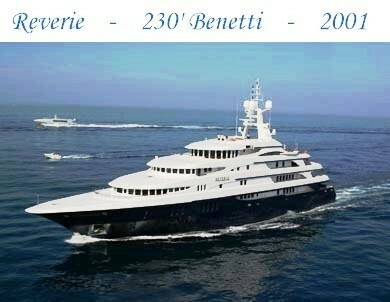 Benetti Yachts finished building motor yacht REVERIE in 2000. As such, she is built in Italy. 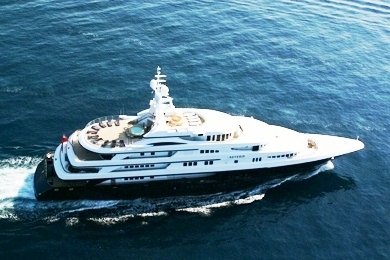 REVERIE had her design created by Fratelli Benetti and Stefano Natucci and Fratelli Benetti. This superyacht REVERIE can sleep overnight a maximum of 26 aboard and in addition to 28 professional crew. Christened in 2000 this boat’s internal styling reveals the scope which are originating from John Munford and the owner who commissioned the yacht. Fratelli Benetti was the naval architect firm involved in the formal nautical design work for REVERIE. Also the company Fratelli Benetti and Stefano Natucci expertly collaborated on this project. Interior designer John Munford was commissioned for the creative internal styling. In 2000 she was actually launched to accolade in Viareggio and following sea trials and detailing was thereafter passed on to the new owner. Benetti Yachts completed their new build motor yacht in Italy. Her main hull was built out of steel. The motor yacht superstructure is made for the most part with aluminium. With a beam of 12.5 metres / 41 ft REVERIE has beamy size. She has a deep draught of 3.14m (10.3ft). She had refit improvement and modification undertaken by 2007. The 3516B engine installed in the motor yacht is built by CATERPILLAR. She is driven by twin screw propellers. The main engine of the ship creates 2000 horse power (or 1491 kilowatts). She is equiped with 2 engines. The sum output for the boat is 4000 HP / 2982 KW. Bestowing volume for a maximum of 26 yacht guests sleeping aboard, the REVERIE accommodates them luxuriously. Under normal conditions she utilises approximately 28 capable yacht crew to operate. 70 metres / 229.6 feet. Total engine power output 4000 HP /2982 KW. 14.5 nautical miles per hour. 5300 at a speed of 14.5 knots. 4 times 240 kilowatts, 1 times 85 kilowatts. Dania Beach. United States. Broward County. Florida. On October 2009 REVERIE visited Dania Beach, in United States. REVERIE also traveled the location including Broward County during the month of Sept 2009. This motor yacht has a teak deck. The luxury yacht REVERIE displayed on this page is merely informational and she is not necessarily available for yacht charter or for sale, nor is she represented or marketed in anyway by CharterWorld. This web page and the superyacht information contained herein is not contractual. All yacht specifications and informations are displayed in good faith but CharterWorld does not warrant or assume any legal liability or responsibility for the current accuracy, completeness, validity, or usefulness of any superyacht information and/or images displayed. All boat information is subject to change without prior notice and may not be current.